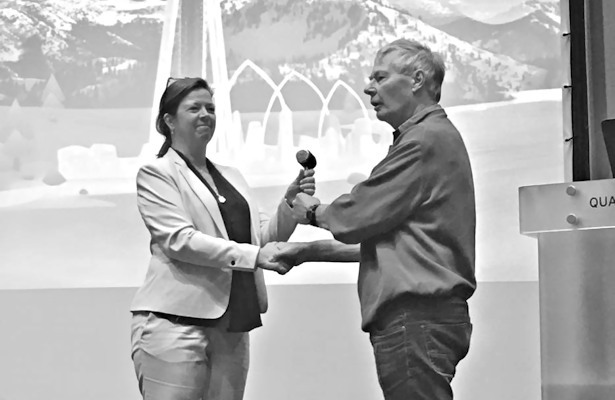 A changing of the guard – Mona Adolfsen is handed the gavel by Rune Gerhardsen, the outgoing President of the Norwegian Skating Association. In the run-up to the biggest figure skating event of the season, the 2019 World Championships, the International Skating Union (ISU) referee, judge and technical controller Mona Adolfsen (President of the Norwegian Skating Association) tells about her motivation to work as an ISU judge as well as the peculiarities of the new ISU judging system. Adolfsen used to work as a figure skating commentator in the Norwegian Broadcasting Corporation NRK. She also works as an editor at Europower, an information and analytics agency. She was appointed as President of the Norwegian Speed Skating and Figure Skating Federation in June 2017. It takes some time to become an ISU judge. A national federation must register a judge for the examination to be approved as an international judge, however, before that, you must have judged at the national top level for a minimum of two seasons (this applies to Technical Controllers now; 3 seasons/36 months service is required to become an International Judge). Once approved, you can be enrolled for the ISU examination. The ISU arranges training and educational seminars for officials on a regular base. Those who judge at international championships conduct a relevant mini-seminar for further approval. Those who do not judge at championships (for example, international judges) must conduct an update seminar at least every four years. “With regard to the technical panel, examination and re-certification every three years are conducted for those who have not been in the technical panel at championships,” Adolfsen explained. The technical panel and the referee for championships are appointed by the ISU. The judging panel consists of judges sent by the respective nations. However, not all nations can send a judge to championships. The competitions are certainly remembered due to skaters’ performances, however, there may be some other significant events that will also be unforgettable. “I have had several unforgettable experiences, both as an international judge and an ISU judge,” Adolfsen recalled. “Obviously, it was quite fun to be part of the panel of judges when Anne Line Gjersem qualified for the 2014 Olympic Games at 2013 Nebelhorn Trophy. In regards to championship situations, perhaps the most unforgettable for Adolfsen was the drama that took place at the 2009 European Championships that took place in Helsinki, Finland, when Carolina Kostner of Italy made a small mistake. She had fallen on the take-off of her triple Lutz in the Short Program where she placed third. In the Free Skate, her second change combination spin was considered an “invalid element” as she had repeated the spin. Laura Lepistö of Finland won gold and the result became somewhat of a highly debated issue. At the 2017 World Figure Skating Championships, held in Helsinki, Adolfsen (Judge No. 8) awarded Evgenia Medvedeva, the first Russian woman ever to successfully defend her world title, a perfect score of 10.00 in “Performance” as part of the component score. She was the only lady in the competition to receive 10.00s at the event. Since then, some significant changes to the ISU judging system have been implemented. The biggest changes that are in effect from this season are to the way that elements are now evaluated. For example, the Grade of Execution (GOE) has been changed to a minus-5 to plus-5 range. In addition, a 10 percent bonus is added to the base value of a jump when performed after the halfway point of a program (for the last jump element in a short program and for three jump elements in free skating). With this new scale, differences in scores from judges can occur for various reasons. If there is a major difference of scores, an Officials Assessment Commission, made up of top level judges, is selected by the ISU in order to make an extra professional assessment of these differences in scores. There are two judges who assess the cases together. To establish the starting GOE, judges take into consideration the bullets for each element (there are six for each element). Pre-rotated and under-rotated jumps in figure skating are a much discussed topic. The standards on awarding scores for the program components appear to be more complicated. The choice of a program and music can influence the score for components, but only in that meaning that the skater manages to meet the criteria by following the music. If the skater/pair manages to use the music and convey it in the form of movements, it does not matter what type of music one chooses. Some top skaters get a higher score for components than the others at the end of their debut season. The ISU judge explains what affects the program components score growth a top figure skater gets during his or her debut season. Some feel that there may be a pre-formed opinion based on a skaters’ titles and that those titles may have an effect on scores awarded by judges. The ISU regulations say that in a program containing Falls or Serious errors, the score nine-fifty (9.5) or higher should not be awarded for Skating Skills, Transitions and Composition and the score nine (9.0) or higher should not be awarded for Performance and Interpretation. However, sometimes we see that judges do not follow this rule and award such scores for components in programs with falls and serious errors as seen below. If judges make obvious mistakes (like awarding high scores for components in programs with falls or serious errors, helping the skaters from their countries with a higher score, awarding the scores much different from scores awarded by other judges etc. ), this should be registered and assessed by the ISU (see comment on Officials Assessment Commission). “It is specifically described in the regulations how many errors made by a judge entail assessment and how many assessments result for the judge in getting a lower level approved by the ISU and possibly repeating the examination,” Adolfsen explained. Adolfsen emphasizes that starting from the competitions on local, national and international levels, the judges try to do their job as good as possible judging what they see from each skater that particular day. Adolfsen gave an example using the 2018 World Junior Figure Skating Championships in which there were 48 participants in the Men’s discipline.